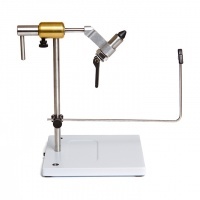 Peak G2 Fly Tying Vice comes top in many US fly tying reviews for its build quality and price. You will not find a better vice at this price. Peak vices have always come out on top in many US fly tying reviews for their build quality, user friendliness, and price, and we think that you will not find a better vice at this price or even double the price. All components in Peaks Rotary Vice are high quality stainless steel, hardened tool steel, delrin, brass, and aluminum (the jaw tube link arm). The powder coated steel base in this peak vise provides a stable work platform as well as a convenient rounded edge pocket for beads, hooks, etc. The vice base includes a second hole for mounting an optional Accessory Shaft as shown in the picture of the vise. A brass tipped set screw and provided Allen wrench allow the peak fly vise to break down flat for travel vise. The hardened jaws can hold hooks from #2 streamers down to #24 midges. The positive stop cam action allows repeatable gripping from the first fly to the last. Additional features in this Peak fly tying vise include a height and length adjustable bobbin rest, a quick change jaw, and infinitely adjustable friction knob. An optional saltwater or midge jaw can replace the standard jaw in under two minutes. The PRV-G2 carries a LIFE TIME warranty against materials and workmanship. MSRP includes the base, bobbin rest and standard jaws . MADE IN USA.